If you live in Michigan, you are blessed to have a multitude of arts and cultural institutions available. It amazes me how many people aren’t aware of these treasures or just aren’t interested in going. So many kids, and even adults, are enraptured with technology, video games and computers. They prefer these items to the beauty of art, learning about the past or witnessing life…in person. I believe that many of these organizations help create a society that respects other cultures, tries to learn from the past and appreciates the world around us so we might take better care of it. 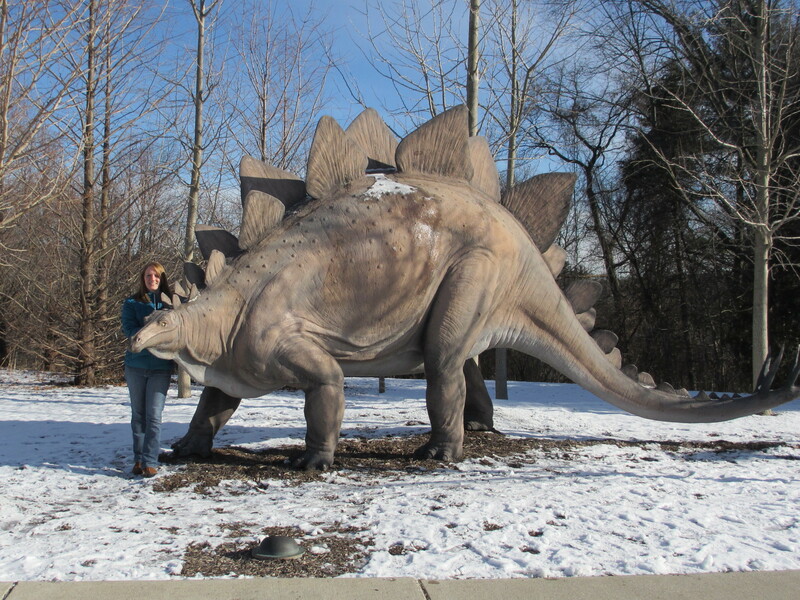 "Steggie" greets visitors to Cranbrook Institute of Science. 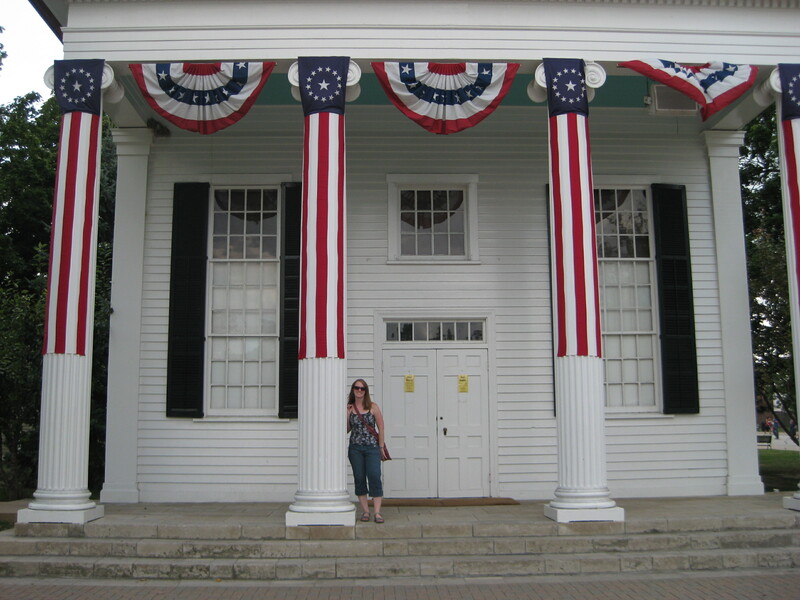 I am lucky that my parents saw the value in these unique organizations and took our family on many outings to places such as Greenfield Village, the Detroit Zoo, Huckleberry Railroad and Cranbrook. As I write this blog, I should disclose that one of my favorite jobs I’ve had was working at Cranbrook Institute of Science. It certainly helped that I worked with wonderful people who kept work days filled with laughter, creativity and kindness. As the public relations person, I had great opportunities to get involved in the daily operations of many aspects of the museum. I often went behind the scenes with the archeologist, astronomer or geologist. I pitched stories to the media and figured out how to market science and natural history to the public. It wasn’t always easy, but I certainly gained an intense respect for our history and the world we live in. And I recognized how fortunate the residents of southeast Michigan are to have these valuable learning venues. Cranbrook Institute of Science: As mentioned above, I worked here as the public relations person for several years so I may be biased. Regardless, this venue is worth mentioning. There are several permanent exhibits, including the T.rex skeleton replica, the Mineral Gallery and “The Story of Us” that features holograms explaining how we’re all tied together through relationships, food, war, etc. I liked the intertwining use of technology and artifacts. 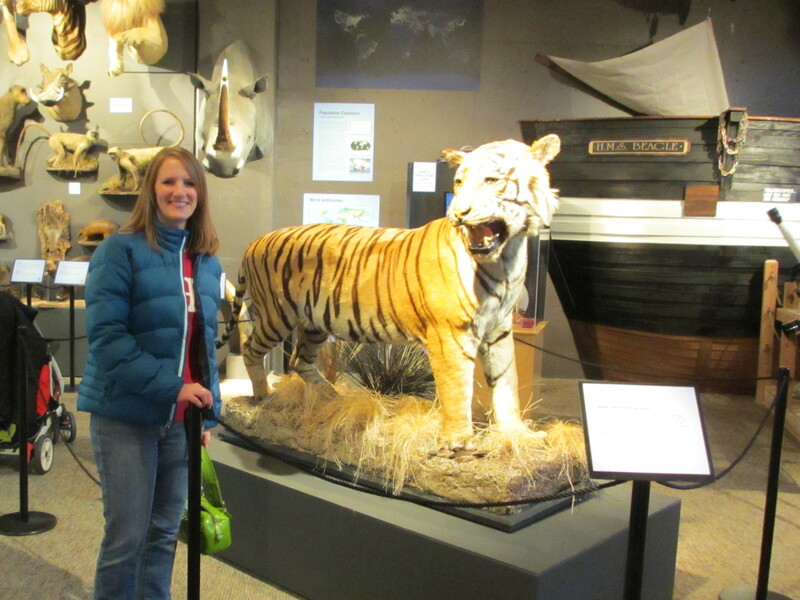 hosting the “Life on Earth” exhibit through Sept. 2, 2012. This exhibit boasts many pieces from the museum’s own collections, as well as pieces borrowed from other museums (I was surprised/impressed to see so many from Wayne State University, one of my alma mater). The exhibit takes you from sea to land to air, learning about extinct and current life on Earth and how mass extinctions and evolution shaped Earth’s history and present. It also touches on diseases such as HIV, highlighting how strains change and these can evolve into epidemics. I was most impressed that the exhibit language appealed to all ages, as I watched my teen nieces stop often to read the signage and discuss. The 319-acre Cranbrook campus is beautiful, especially in the spring/summer when the trees and flowers are blooming. Also on the campus is Cranbrook Art Museum & Art Academy, Cranbrook House & Gardens, and of course the well-known Cranbrook Schools. How amazing is this lion exhibit? Much easier to view the big cats. visit. The Detroit Zoo sits on 125 acres in Royal Oak and has several types of habitats housing more than 1,500 animals in 260 species. The Arctic Ring of Life is one of the more popular habitats, especially when the polar bears are active and viewable to the public. I remember when the Australian Outback opened – it was a different type of exhibit that enabled visitors to actually walk through the habitat as the kangaroos and other marsupials were sometimes mere feet from you. 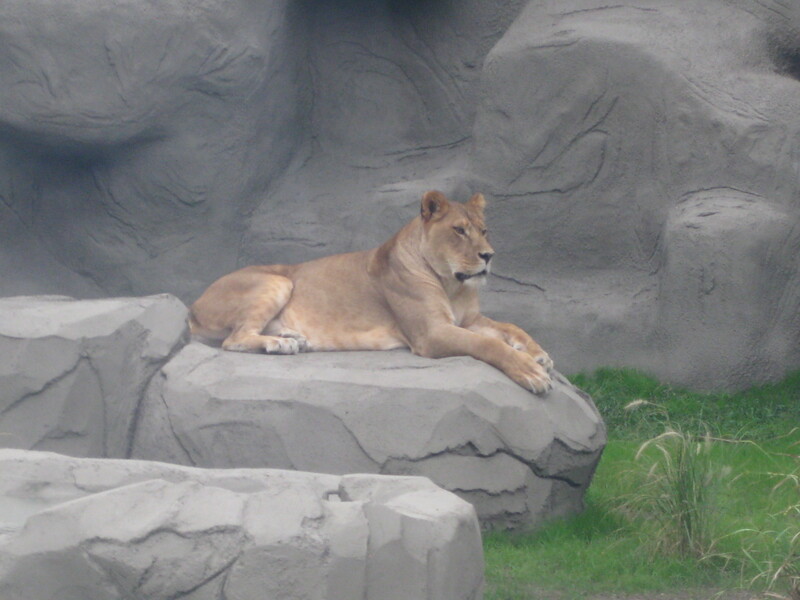 One of my favorite habitats is the remodeled lions’ exhibit. It’s awesome. Tall, clear glass separate the big cats from the public, allowing you to get pretty up close to the animals without risk of losing your arm. The exhibit also has background information on the lions (I never knew the lions came from a crack house in Detroit, a junkyard and someone’s basement. It stuns me how stupid people can be – who thinks it’s ok to have a huge, wild lion as a pet?). famous historic figures, I love walking through the past. It makes me appreciate where we’ve come from and sometimes pause to wonder if we’re heading in the right direction. While at Greenfield Village, you can watch an old-fashion baseball game, ride in a Model T and enjoy a whirl on a great carousel horse (because who doesn’t love riding a carousel?!). The museum holds so many facts on our nation’s history, which if you’re reading this as an American, it’s your history too. Exhibits highlight amazing machines such as the first steam engine and airplanes. The exhibit on liberty and justice showcases important eras, from the Revolutionary War to woman’s suffrage to civil rights. You can also view the Kennedy limo and the Lincoln chair, which should make one pause to realize how our nation’s path changed with these two assassinations. Detroit Institute of Arts: This remarkable museum has more than 100 galleries in its 658,000 square feet (plus a restaurant, auditorium, library and laboratory). According to the DIA, their collection is among the top six in the United States (I believe it). Whatever type of art you’re interested in, you will most likely find it at the DIA. I love meandering through the galleries, always noticing something new or learning a new fact. The museum also hosts many events and special exhibits throughout the year – hours are extended on Fridays for live music, guided tours, workshops and more. All of these organizations have single and family memberships, which can save you money if you plan to go several times in a year (which I encourage!). Sometimes they participate in the Entertainment Book coupons. You should also check with your library to see if you can get a Museum Adventure Pass that provides free or discount admissions to many local arts and cultural attractions (although this program ends in May 2012). There are literally hundreds of other arts and culture organizations in southeast Michigan and beyond. The Ann Arbor Hands-On Museum is great for children; Interlochen, just outside of Traverse City, boasts a tremendous music and arts program, including great musical programs, film screenings and more for the public; the Detroit Historical Museum highlights the region’s history; there are also many local theaters throughout the state that put on wonderful performances. So what are you waiting for? Take advantage of the rich history, fun and amazing animals accessible to you. Start planning your next visit to a local arts and culture organization! Thanks for your comment. I love that metro Detroit has so many wonderful places to visit. We’re lucky!